There’s a good movie somewhere in Solo: A Star Wars Story. Perhaps a better director and screenwriter could have found that story. I know Lawrence Kasdan is responsible for The Empire Strikes Back, Raiders of the Lost Ark, Star Wars: The Force Awakens, etc., but every good screenwriter has duds and Kasdan’s more recent work has, in general, not held a flame to his earlier work. Solo is no exception. The film is utterly devoid of any of the character development that Kasdan made his career off of highlighting. By nature of this film, Han can only develop so far since we know how he has to end up by the end of the film as we’ve already met the older version of him in A New Hope. In fairness, prequels are hard. It’s hard to have real, believable character development when your lead characters have to end up in a certain place by the end of the film. I get that. I don’t envy the Kasdans for having to cope with that, though it does beg the question of whether or not this should’ve been a Han Solo film. I’d say, “No.” There’s a fairly interesting story here, if a bit run of the mill. 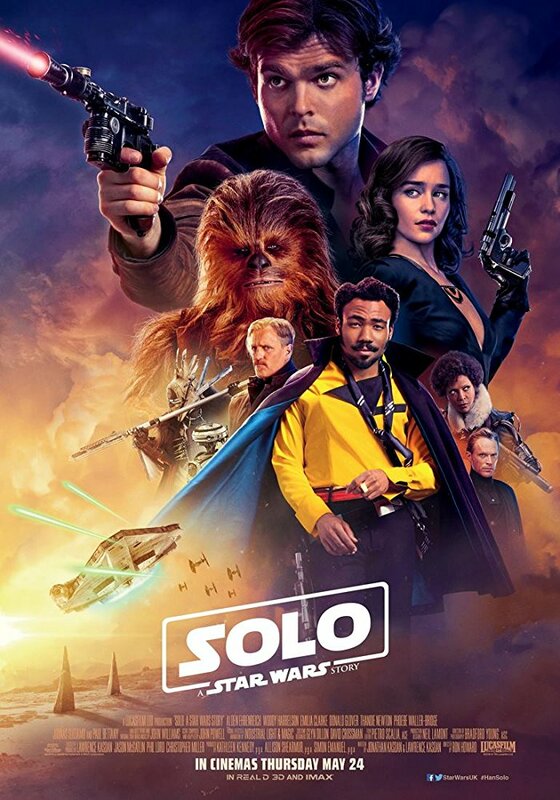 Han Solo (Alden Ehrenreich) encounters a group of smugglers led by Tobias Beckett (Woody Harrelson) and ends up going on a heist with him at the behest of space mobsters Dryden Vos (Paul Bettany). 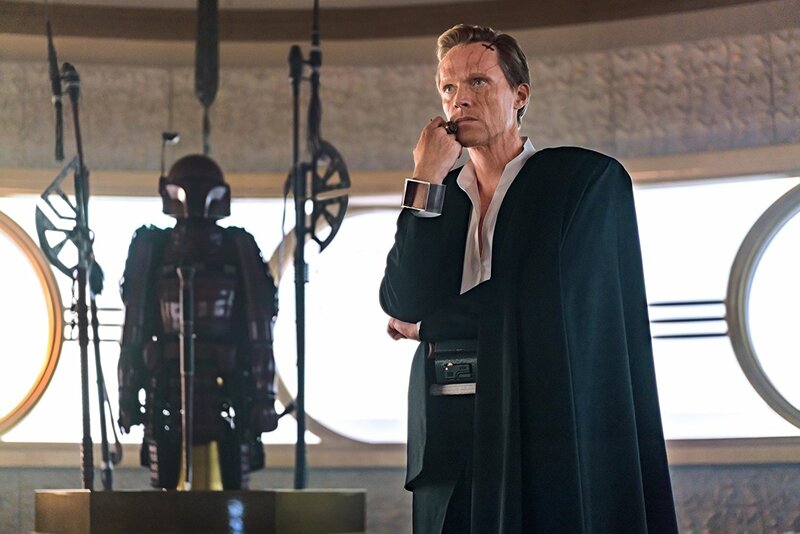 It’s fairly predictable and doesn’t always work, but what makes it interesting are all the tidbits about the seedier side of the Star Wars universe. Unfortunately, the film never seems all that interested in developing any of that, so all those interesting elements stay as juicy tidbits hidden in a generic piece of film. 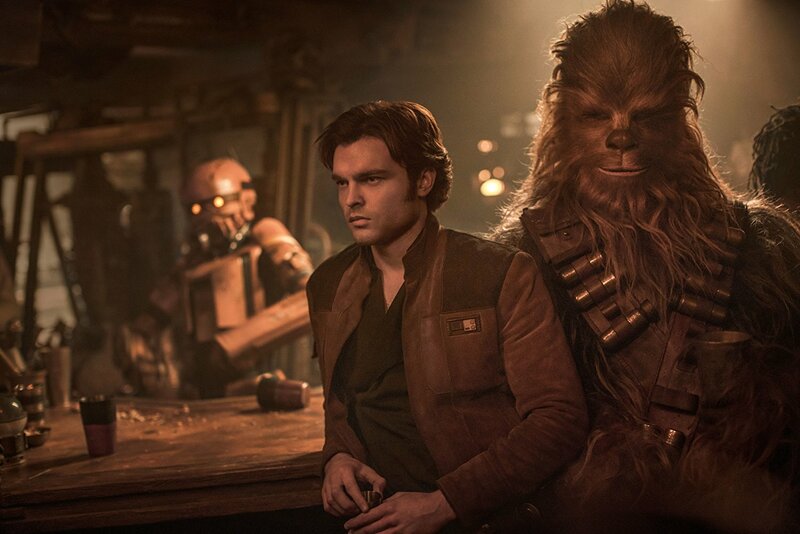 Like the plot, the characters are all wooden and flat, mostly because they have to play second fiddle to Ehrenreich’s Han Solo. And there’s the film’s biggest problem: Han Solo. Due to the whole we-know-where-he’s-gonna-end-up thing, the film can’t actually do anything new or interesting with the character, so instead, we get a pretty run-of-the-mill backstory featuring him being an orphan on this planet and having to work for this weird criminal alien lady who takes in orphans and forces them to be criminals. He joins the Empire to get away from that, flunks out of the Imperial Academy, and returns to a life of crime that leads him to become the man we saw in A New Hope. There’s nothing particularly interesting there and nobody was really clamoring for all the details of his backstory; it didn’t really matter to the character we knew and loved. There’s just nothing you can really do with a Han Solo prequel movie. It’s a shame because some of the plot elements are interesting and would’ve been a lot better had the film been able to focus on developing them instead of wasting time on the shoehorned-in Han Solo backstory. Within the context of the film, there’s no reason that it had to be about Han Solo at all. Any generic space gangster could have been substituted in Han’s place and nothing would have changed other than Han ultimately winning the Millenium Falcon. The film would lose nothing from the total excision of Han and would gain the possibility of an actual compelling lead character. You could even keep Alden Ehrenreich as the lead actor, playing a smuggler who just wasn’t Han Solo, because, really, Ehrenreich did a fine job in the film. He’s a good actor and he really was charming (and by the end of the film, he did start to feel like Han Solo) and I’d have been interested in seeing what he could’ve done with a character who wouldn’t always have the shadow of Harrison Ford looming over him. The rest of the cast members are similarly good, though a bit underused. None of them are given much, at all, to do since none of them are given any kind of development at all. 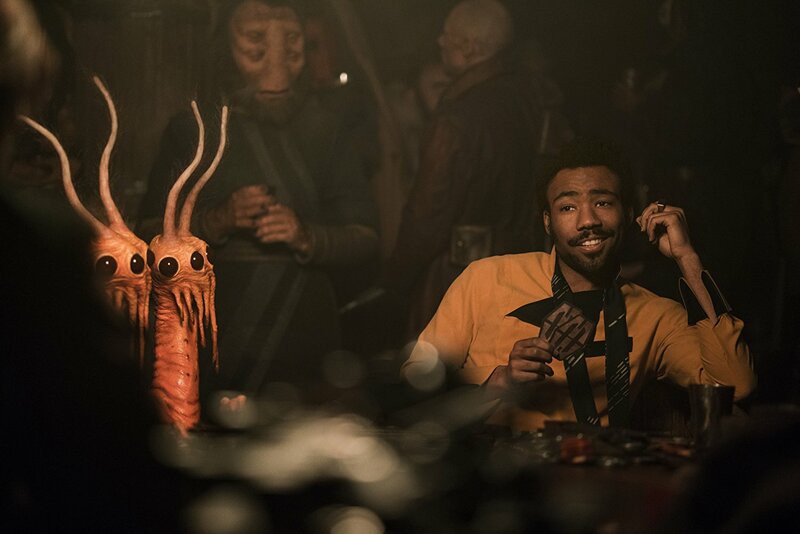 Donald Glover is great as Lando, but the character is literally just a younger version of who he was in the original films (suave, a bit of a backstabber, etc); Emilia Clarke is fine as Qi’ra but isn’t given much to do outside of being Han’s love interest until the end of the film; Woody Harrelson is basically Woody Harrelson in space as he plays the generic mentor character in the film; Paul Bettany and Erin Kellyman are given the least to do as Drydon Vos and Enfys Nest (respectively), the film’s antagonists. Both appear in a total of two or three scenes and, Drydon Vos in particular, aren’t developed into much of anything. The film’s biggest problem is that it’s a Han Solo movie. Had it just taken the same story and told it from a different point of view, allowing for more character and plot development, this really could have been a good film. We could’ve had a more developed villain/overall threat. We could’ve had more three-dimensional characters and clearer motivations and arcs. The story could’ve been stronger. All of these things could easily happen if the writers hadn’t spent all their energy focusing solely on the Han Solo character. It’s a waste of time because there’s so little you can do with the character that hasn’t already been done. I’d have loved a movie with a better-developed version of this plot and mostly new characters that focused on smuggling and the criminal underbelly of the Star Wars universe. That’s an interesting idea (and it was one that was behind a TV series and a video game at one point prior to the Disney buyout). 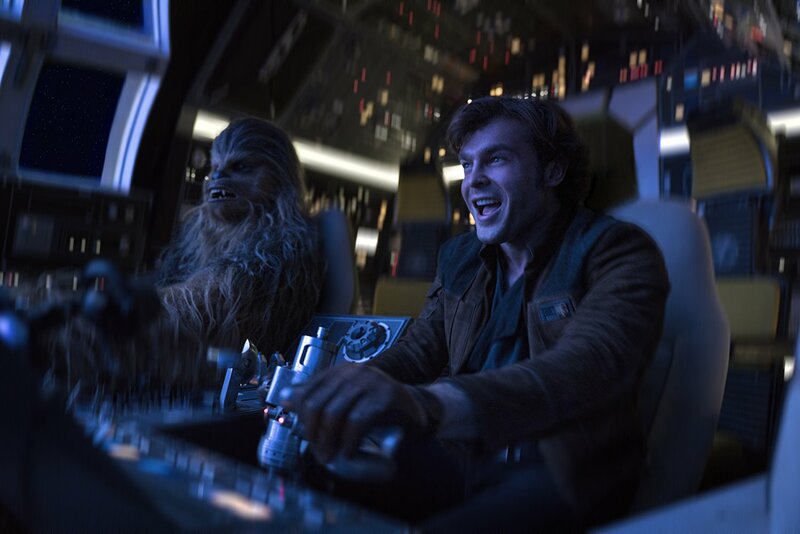 Solo clearly wants to be that movie, but it can’t divert its attention away from Han Solo long enough to develop any of those ideas and the film suffers for it. 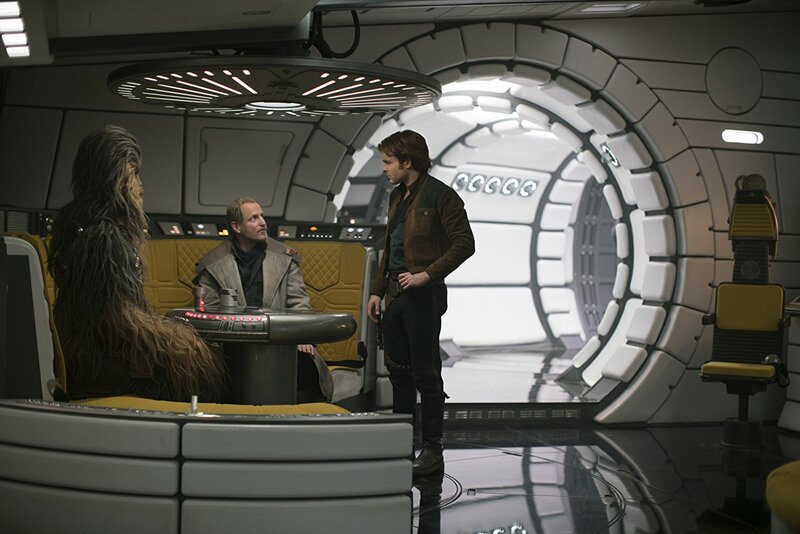 On the whole, Solo: A Star Wars Story is fine. It doesn’t have the audacity to be as unenjoyable or messy as The Last Jedi, but it’s never as good as it wants to be either. There are some good ideas hidden underneath the layers of mediocrity and predictability. It’s oddly paced, competently directed, well acted, and features a pretty good score, but it’s all bogged down by a script that spends no time developing the characters or the central threat and as a result, it all falls a bit flat. Characters are disposed of left and right, and while the stakes for the characters are high, it never really feels that way for the audience. We already know how the film is gonna end and so there’s not much that can be done to get around that. It’s not the worst Star Wars movie, but it’s nowhere close to being the best. It’s a mostly enjoyable, entirely forgettable film that would’ve been better if it didn’t feature Han Solo at all and featured more character and plot development in his place. 3 out of 5 wands.